Ocean week is coming to a close over here, and you know that I couldn't go out without a mermaid inspired treat. 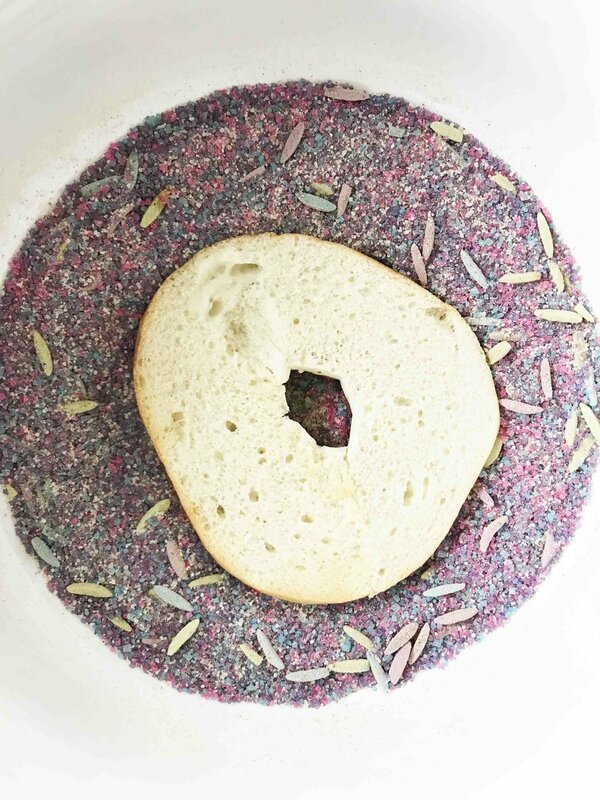 Since my daughter currently has an obsession with mini bagels, I thought it would be fun to make a sweet kid-friendly version of bagel crisps. Being as we're going for the mermaid look, I decided to swap a traditional cinnamon sugar topping with a more colorful option. As you can see, the end result is pretty cute and surprisingly good too! I've never made my own bagel crisps before, so I wasn't quite sure what to expect. But, they turned out perfectly crisp; just the right amount of crunch and chew together. I did account for all of the cinnamon sugar in the nutritional information, even though I had about half of it leftover to be thrown out after making these. I used a bright blue and a bright pink colored sugar on mine, but if I had it on hand, I would have liked to have used a green in there too! 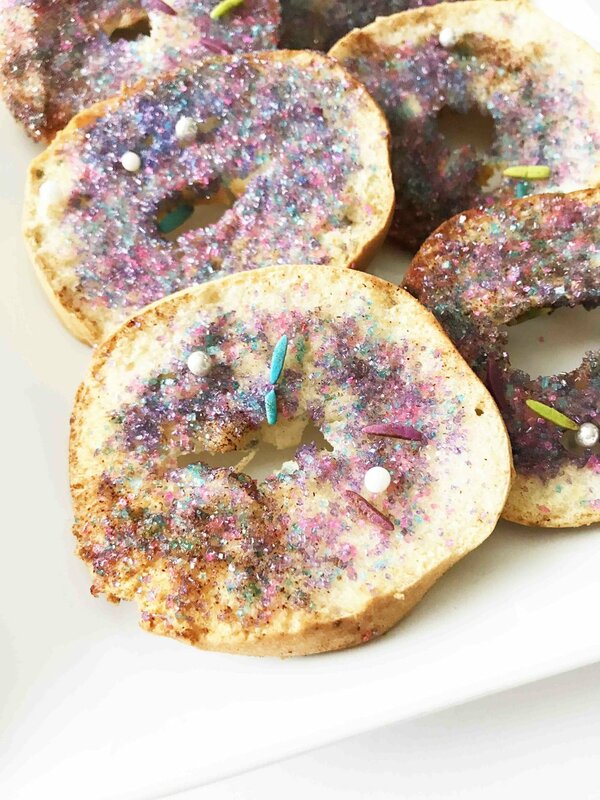 That's one of the fun things about these bagel crisps; that you can decorate them any mermaid style that your kids desire. It's also worth mentioning, that this is one of those kid-friendly easy recipes that they can help you with making. These sweet little gems are delicious all on their own, but would also be good with a 'fruit salsa' or some sort of refreshing dip too! Trust me, their crisp enough to hold their own against almost any sort of dip or spread that you could throw at them. Crispy little bagel bites that are baked with colored sugar and some cinnamon for a fun kid-friendly twist on a classic snack! Preheat the oven to 325 degrees F. and line a baking sheet with parchment or a silicone baking mat; set aside. Slice the bagels in half width wise, and again in half to cut each bagel into 4 thin slices. Place the 1/4 C. colored sugar, 2 Tbsp. sweetener, and 1/2 Tsp. cinnamon into a small bowl and whisk together until well blended; set aside as well. NOTE: You may add other colored sprinkles if at this point too, if desired. Using a brush, spread the melted butter onto one side of each of the bagel slices. Press each down into the sugar mixture before arranging on the prepared baking sheet. Place the baking sheet into the oven and bake for 15-20 minutes, or until the edges are starting to brown. Remove from the oven and allow to cool slightly before removing to a cooling rack. The crisps will continue to crisp as they cool. Once completely cool, enjoy right away or store in an airtight container on the counter for 3-5 days.